You Changed My Life is the sequel to the 2008 blockbuster movie "A Very Special Love", starring Sarah Geronimo and John Lloyd Cruz. The story is about the continuation of Laida Magtalas and Miggy Montenegro as a couple and the hardships they encounter to sustain their relationsihp. Laida Magtalas played by Sarah Geronimo, lives with her big family. 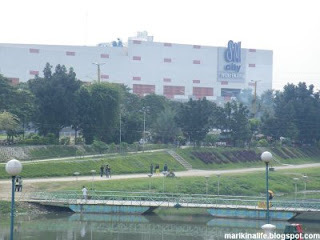 The movie uses one side of the Marikina Riverpark as their home. 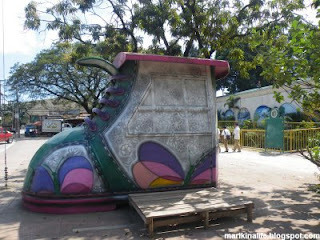 Several scenes were taken along the Marikina Riverpark trail and Marikina RiverPark establishments. Clear shots of the river, the huge OTTO shoes sign in the background, several decorations at the center of the river and some of the restaurants situated along the river trail's stretch were used as on-location scenes. The beautiful garden wedding reception scenes too were taken at one of the reception restaurants on the left side of the riverpark (from the bridge). I heard about their movie taping in this area several months ago. Yesterday, I got to see it when I watched the movie. It's predicted to be another hit blockboster following the original movie's success. 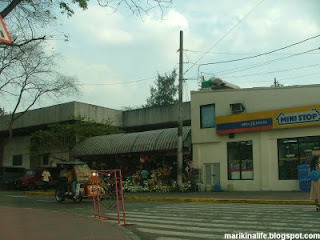 If you're the type who loves to give flowers to your loved-ones, then the best place to go in Marikina is in Bayan. 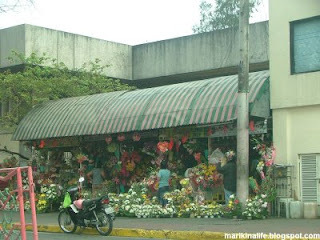 Just at the side of the plaza (beside Ministop) fronting Marikina City Hall is a line of flower boutiques. They are open as early as 6am till 9pm. And during special occasions like Valentine's day, they are open as long as there are customers. Their prices are very affordable even if it would increase during this peak season for flowers. It's advisable to get there early cause even though flowers are delivered to them several times a day, the sheer demand for flowers during Valentines day may cause flowers to be sold out. You'll see cars parked all around them as the days come closer to Valentines. I personally get my flowers from my suking florist, June & Chat flowers. They can create custom arrangements based on your requirements. Look for the morena with the smiling face and she'll happily assist you. District Dispatch, a Free Ads Magazine has been circulating in Marikina since 2003. 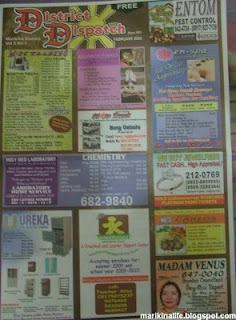 The magazine includes ads from product offerings like office equipment, jewelry and condos to home services like piano tuning, computer repair, spa and massage treatment and catering. Distrution is up to 15,000 copies circulating around Marikina City and a reader base of 75,000. 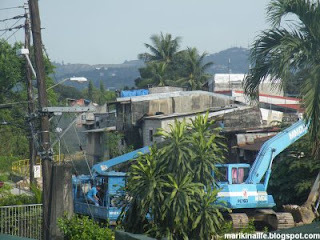 The ads and distribution are not limited to Marikina City. Nearby ares in the East such as Quezon City, Pasig City, Cainta and Antipolo also receive an additional circulation of 15,000. District Dispatch is released once a month. You can get your copies at Bluewave Marquinton, Burger King Marcos Highway, Brick Road and Theater Zone of Sta Lucia East Grand Mall, C^B Circle Mall, Cherry Foodarama, Fitness First at Robinsons Metro East, Sta Lucia Health Care Center, and Kingsville Subd. Within the Ortigas area, you can get a copy at Ever Gotesco Mall, City & Land, Mega Plaza, Antel Global, Prestige Tower and 1 Shop, Vista Verde. For inquiries, call 682-8535, 710-5254 or e-mail districtdispatch@yahoo.com. Just across Pan de Amerikana bakery in Marikina Heights is a new restaurant called Madison Avenue. 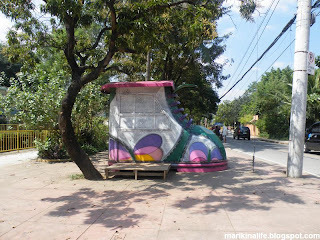 It has nothing to do with where its located cause it's along Gen. Ordonez St. This cozy restaurant recently opened in January 2009 and serves from 7am to 10pm. Entering the restuarant, you'd have the impression that it's an enclosed area due to the grills on each side and the huge hut-like top, but it's actually an open-air area. The chandelier lighting, figurines and decorations make the place a homey one, as if you were just beside a mansion's veranda. There are some nipa huts at the back and a 2nd floor for functions. Also, when you enter, there is an enclosed sqare room which seems to cater to after-meals as the cookie jar and a ref with some desserts were situated. 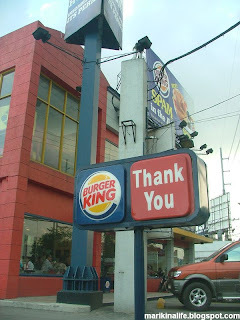 Their food groups comprise of breakfast favorites (tocilog, tapsilog, longsilog and daingsilog), tasty sandwiches (chicken sandwich and grilled cheese sandwich), pastas (baked macaroni, chicken fusille and carbonara), sizzling specials (sizzling porkchop, taningue, bangus, tilapia and devilled hotdogs), merienda (pancit bihon, canton, guisado) and grilled dishes (pork bbq, chicken bbq and grilled liempo). I ordered the sizzling porkchop which includes a cup of rice, soup and softdrinks. As the name suggested, my order was served in a sizzling plate with beans and grazy poured over the porkchop. The serving is just enough to satisfy an empty stomach. The bottled softdrink though is served in a 240ml bottle, so you may need additional drinks if you're the thirsty type. The dishes are moderately priced so it won't be costly to try any entree on the menu. Overall, I find the place cozy and gives you the feeling of dining at home, but a much bigger home. Try it out when you pass by Marikina Heights. If you're coming from Antipolo headed to Quezon City via Marcos Highway, you can turn right just before SM City Marikina. The road splits to two: one road leading to parking at the back, and another which leads to the front of the mall more as a pickup and drop off point. Now, you can also take the Diosdado Macapagal flyover and before it curves away from SM Marikina, an access road to the right is open to motorists. This also leads to the other side of SM City Marikina parking but it also leads to another road that passes underneath the Marcos Highway bridge and goes back to the other side of Marcos Highway. In short, it's kinda a wide U-turn (which doesn't happen to be U-turn in shape). The road is ideal for dropping off and picking up people from the LRT Santolan station since you'll be at the side of the LRT terminal. 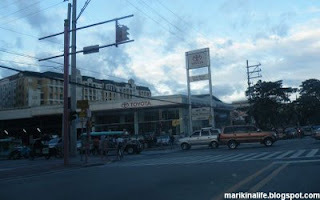 Toyota Marikina is one of the busiest car dealer brands in Marikina City. Aside from sales and a showroom displaying its latest models, Toyota also serves as Service Station for Toyota owners. Due to its limited space, Toyota is also renting the lot behind Metrobank to accommodate their influx of cars, whether brand new or cars being serviced. This is why they will be moving to a newer and bigger lot. 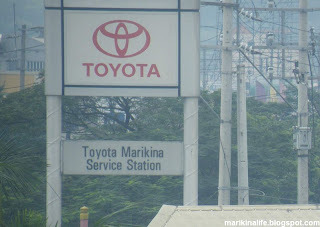 Toyota Marikina will be moving to the grassy vacant lot beside Kia Marikina alonng Sumulong Highway and just across the future site of Toledo Towers. They will practically be near the outskirts of NCR (National Capitol Region) as Sumulong Highway leads to Cainta and Antipolo, both in Rizal. However, the huge lot will cater to their need for a bigger area for their operations. Although the transfer has been approved, Toyota is not certain when the transfer will take place. With this move, I hope for yet bigger and better things to come from Toyota Marikina. 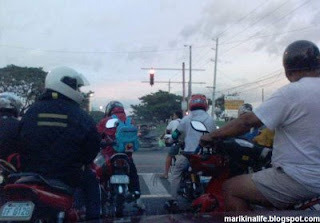 Marikina City strictly observes the helmet ordinance for motocyclists. 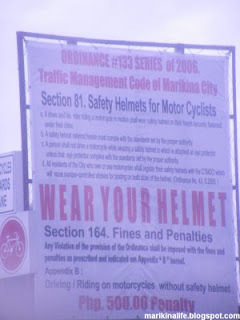 Ordinance #133 series of 2006 from the Traffic Management Code of Marikina City states that motorcyclists must wear a helmet at all times while in transit. Failure to do so will be fined P500. You may think that you can get away with it for short trips and trvavelling during odd times of the day. 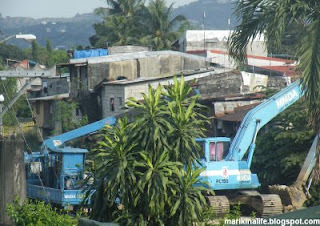 But Marikina City traffic officers put up random checkpoints at random times of the day within the city. So rather than take a chance, it's better to abide and wear your helmet. Besides, it's for your own protection.